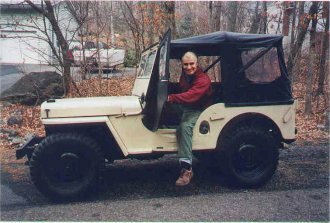 "This original 1945 CJ2A had ll,066 miles (vehicle's appearance matches) when I bought it. 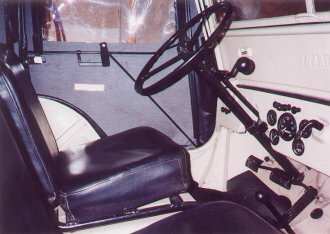 It is a very early CJ with serial number 10,284 (body, firewall and dashboard numbers all match) in exceptional condition. 100% intact. It has the early CJ full floating axle, column shift and tool indents on side panel plus all the other original early jeep details. A modern Best Top top and paint to freshen it up was added by previous owner. There has never been any rust through or damage. The vehicle for the most part was sheltered and cared for its entire life. I have a copy of the original title which is in the name of Harold Sterling Vanderbilt, from the famous Vanderbilt family. 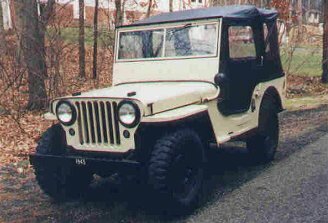 "The jeep was bought by Harold Sterling Vanderbilt in 1945 for use on his farm, Mt. Airy, in Mt. Jackson, Virginia. The farm had the largest acreage owned by one family in the Shenandoah Valley. Mr. Vanderbilt would drive the CJ around the farm on weekends when he would come up from New York. Mr. James Hiner, whose father was one of the managers of the farm, grew up on the farm in one of the houses there. He would see Mr. Vanderbilt take the jeep out for a ride on his property, decide to walk back and then send his chauffeur out to find the CJ and bring it back. Mr. Hiner said that one time it took the staff two days to find the jeep. Mr. Vanderbilt kept three cars at the farm: A Willys 4-door Americar, A Chrysler Woody Station Wagon, and the CJ2A. Mr. Vanderbilt apparently "drove like crazy". When he drove his '56 Thunderbird up from New York himself, nobody would ride with him. His staff would come up in a separate car. "After the CJ was sold, it was put on loan in a military museum in Strasburg, Virginia called The Vintage Tin. I am continuing to research the history. "Harold Sterling Vanderbilt (1884-1970) was the great grandson of Cornelius (The Commodore) Vanderbilt (1794-1877) the American railroad magnate. Harold was a sportsman. He won the America's Cup Yachting races three times in the 1930's and invented the modern game of contract bridge."